2nd in a series: here’s the opener, reviewing the Major league squad. For some historical perspective, here’s 2012’s version (featuring John Lannan) and 2011’s version (featuring Tommy Milone) of this post for AAA Syracuse. 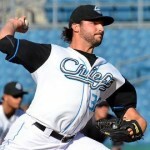 All stats are courtesy of either milb.com’s Syracuse Stats page or via Fangraph’s Syracuse Stats page. Also useful here are the Big Board and the Nats Draft Tracker. Syracuse starters. The rotation started the season with Ohlendorf, Roark, Maya, Perry and Rosenbaum. It finished the year with Maya, Tatusko, Rosembaum, Mandel and Clay. Here’s an overview of the starters Syracuse used, starting with the original 5. Ross Ohlendorf took a minor league gig with the Nationals to try to revitalize his career and went a somewhat pedestrian looking 4-6 in 13 starts. His FIP (3.49) was better than his ERA (4.22) and his K/9 was good as he revamped his windup. A streak of good starts led to his June call-up, where he basically spent the rest of the season as the Nats’ long-man/spot starter. He tired as a starter, only going past the 5th inning three times, and Davey Johnson seemed hesitant to use him because of it. Outlook for next season: he did enough to get tendered a contract (which he quickly signed; 1yr/$1.25M), and seemingly he will slot back in as the long-man/spot-starter role for the MLB team. He doesn’t seem to have enough to compete and win the 5th starter competition. Will the team dump him to AAA as an inexpensive starter insurance policy? I doubt it for now; they probably opt to keep Ohlendorf as the last guy out of the pen. Tanner Roark started in the rotation, got shelled in his 2nd and (especially) his 3rd starts, and got dumped to the bullpen. He toiled there for weeks before getting another shot in the rotation, and when he did he did very well. By the time he got called up in August he had recovered from his 3 2/3 inning 10-run debacle in early April to post a 9-3 record with a 3.15 ERA and a 0.99 whip in AAA. All he did upon arriving in the majors is pitch lights-out (a 252 ERA+) in 50 innings mixed with starts and relief appearances. Outlook for next season: he’ll compete for the 5th starter job in spring but may not win it. Its hard to imagine a guy who threw 50+ innings of 1.50 ERA ball to NOT make the team the following spring; he could end up replacing Ohlendorf as the long-man/spot starter for the MLB team. Yunesky Maya made nearly a complete season worth of starts for Syracuse, going 8-8 with a 3.87 ERA. However in his third (and last) opportunity to pitch for the major league club he got hammered, which led to a DFA in late May and an outright to Syracuse. Maya pitched out the string, was not called up in September and was released in late November. Outlook for next season: he has signed a minor league contract with Atlanta, closing the book on an unsatisfying tenure with the Nationals organization. Ryan Perry started the year in the rotation under the National’s grand plan to make him a starter, and the experiment failed. 8 starts later, he boasted a 7.93 ERA. He hit the D/L, then was demoted to Harrisburg. There, he was outrighted off the 40-man roster and returned to the bullpen, where he was mediocre (4.43 ERA). How odd; last year we were worried about Perry getting that needed 4th option; now he’s an org arm in AA. This guy was pitching in a playoff team’s bullpen at 22, now he’s turning 27 and banished in the mid-minors. Amazing. Outlook for next season: he has to show he can get AA hitters out; you have to think he’s starting in the AA bullpen again, unless a numbers dearth pushes him by attrition to the AAA bullpen. 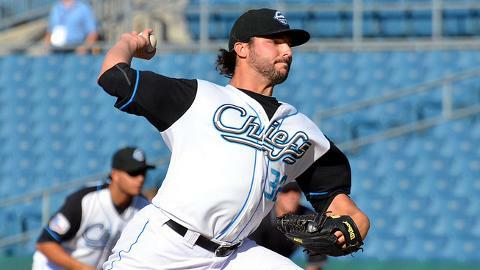 Danny Rosenbaum had a whirlwind spring, getting rule-5 drafted by Colorado and then subsequently returned in late March, just in time to pack his bags for upstate New York and take his spot in the back end of the Syracuse Rotation. Rosenbaum led the 2013 rotation in starts and innings, going 7-11 with a 3.87 ERA. He did not earn a September call-up, nor was he selected in 2013’s Rule-5 draft. Unfortunately, Rosenbaum seems to have found his ceiling and may need a change of scenery to see if he can move forward. Outlook for next season: one more season as Syracuse’s innings eating lefty, then a minor league free agent at the end of 2014. Ryan Tatusko gave Syracuse a full season of swing-man production, starting in the pen and then ending in the rotation. Final season stats: 5-8 with a 4.33 ERA in 28 appearances (18 starts). Nothing special here: I just wish I knew what happened to the guy who was a lights-out starter for Texas’ AA franchise when we acquired him in 2010. Outlook for next season: Minor League Free Agent, likely pitching in another organization. Caleb Clay gave both AA and AAA 13 starts a-piece, finishing the year in Syracuse with excellent numbers (5-2, 2.49 ERA in 13 starts in AAA). He turned out to be an excellent minor league FA signing for the organization; too bad they couldn’t keep him for 2014. I was somewhat disappointed to see him signing elsewhere, thinking that he could be a sneaky good pitcher for the Nats someday. Outlook for next season: signed with San Francisco as a minor league free agent for 2014, where he stands a halfway decent chance of contributing at the MLB level, considering how bad Ryan Vogelsong and Tim Lincecum were in 2013. Jeff Mandel continued to serve as the rubber arm swing man for Syracuse, a role that he’s essentially played for the Nats AAA affiliate in one way or another since 2010. This year he got 10 starts and 100+ innings and continued to show unfortunately that his peak is as an organizational/innings eating arm. Outlook for next season: Minor League Free Agent; he could sign on again with Washington as he did last off-season but he has to think that his path to the majors is easier with another team. Chris Young was signed to a combo deal last off-season to give the team some starter insurance. Instead he started hurt, pitched horribly in 7 starts, then went back on the D/L for essentially the rest of the season. He gave up 50 hits in 32 AAA innings and was smoked for a 7.88 ERA. Outlook for next season: the Nats must have seen something they liked during his rehab assignments, because they’ve already signed him to a minor league contract for 2014. AAA rotation, hopefully healthy this time. Brad Meyers was rule-5 drafted by the Yankees in 2012, got hurt for them, and was eventually returned in time for the 2013 season, but spent the entire year on the D/L. He’s got enough time to be a MLFA but isn’t on BA’s list so I presume he’s still in the organization. Outlook for next season: competing for a rotation spot in AAA; likely to be released if he doesn’t make the team. Matt Torra had 5 starts in June/July then got released. Taylor Hill got a couple of spot starts in August and was sent back to AA; see Harrisburg’s writeup for more on him. Christian Garcia got a couple of “starts” doing re-hab assignments; see the reliever section. Tyler Robinson had a spot start and an extended outing; see the reliever section. Paul Demny got a spot start call-up and was sent back down; see Harrisburg’s writeup for more. Syracuse Relievers: taking a look at the relief corps. We’ll organize relievers by looking at closers first, then by innings pitched. Erik Davis was Syracuse’s closer in name for a bulk of the season, earning 15 saves while posting a 3.10 ERA in 52+ innings. He was a Sept 2012 pre-rule5 40-man addition and spent a week in the MLB pen in June before getting recalled for September. Out of his 10 MLB appearances he gave up zero runs in 9 of them and showed excellent middle-reliever stuff (12/1 K/BB ratio in 8 2/3 innings). Outlook for next season: I don’t think he can crack the 7-man MLB bullpen so he’ll be in Syracuse again, but there’s a reason he got added to the 40-man and I think he features as MLB bullpen insurance throughout the year. Michael Broadway was a MLFA signing who gave the organization excellent back-of-the-bullpen production the whole year, starting with Harrisburg and ending with Syracuse. Outlook for next season: he has already signed a MLFA deal with Toronto for 2014, somewhat of a disappointment. Like Clay, I would have liked to have kept this guy around if possible. Michael Crotta was another organizational-filling MLFA signing in 2013 who, like Broadway, toiled well and ate innings in Syracuse. Outlook for next season: MLFA again, likely signing elsewhere. Tyler Robertson was a June 2013 waiver claim off of Minnesota, grabbed to help address the team’s lack of left-handed relievers. Robertson pitched decently for Syracuse but was passed on the Loogy depth chart by several others. He was outrighted in November ahead of the Rule-5 draft. Outlook for next season: Syracuse bullpen, though if i’m not mistaken he’s got enough service time to be a MLFA. I wonder if his outright and acceptance of assignment to Syracuse was effectively the Nats signing him to a 2014 ML contract? This is a frequent question and I’m not enough of an expert on baseball transactions to know the answer. Xavier Cedeno was an April 2013 waiver claim off of Houston (of all teams), who spent most of the season in Syracuse (save for a quick June call-up). In September, he pitched pretty effectively, giving up just one run in 9 outings and 11+ innings for the big team. He clearly hasn’t shown the team enough to be counted on as the go-to loogy, considering the Nats off-season trade for Jeremy Blevens and their talk of using the likes of Ross Detwiler and/or Sammy Solis as lefty reliever help in 2014. And I know that many here think Cedeno is making the MLB roster; I just don’t see it right now. Outlook for next season: Syracuse bullpen. Cole Kimball just never made it back from shoulder surgery and was outrighted in July. He had an 8.06 ERA this year in 25 2/3 innings. Outlook for next season: MLFA, likely out of baseball unfortunately. Shoulder surgeries are just a killer. Fernando Abad was a MLFA signing last off-season who pitched great for Syracuse and earned a call-up in May. He toiled in the pen decently most of the year for the big-club but wasn’t considered valuable enough to keep. The team DFA’d him ahead of this year’s rule-5 draft and then worked out a trade with our favorite GM Billy Beane. Outlook for next season: in Oakland’s organization. Christian Garcia got just 8 1/3 AAA innings this year (and 13 1/3 total in the minors on all rehab assignments) after getting hurt in spring training as the team tried to stretch him out as a starter. I think the team now sees the error of its ways with Garcia, a fragile guy who has survived multiple surgeries to this point. His stuff is so good, he’s a shoe-in for a MLB job if he’s healthy, but who can count on him to be healthy at this point? Outlook for next season: if healthy, he’s competing for a 6th/7th inning role in the MLB bullpen. He’s got plenty of options left though, so its likely he starts in the AAA bullpen given the crowded nature of the MLB pen right now. Jeremy Accardo: signed in February, released in June after a 5.56 ERA in 22+ innings. He did not resign anywhere and may be done. Bobby Bramhall was signed in November, and released 3 weeks into the season after posting a 6.75 ERA in 16 innings to make room for Cedeno & Young on the roster. He was picked up by Philadelphia and ended the season demoted to their AA team. J.C. Romero opted out of his contract after 2 months despite 15 decent apperances; it was clear the Nats weren’t calling him up and were favoring other loogy candidate acquisitions. He was picked up by Cleveland, threw two innings and apparently went on the D/L. Pat McCoy failed to make the jump from AA to AAA and was demoted back after 7 ineffective appearances; see the Harrisburg write-up for more. Brian Dupra was called up for one game oddly; he spent most of the season in low- and high-A. See Potomac’s write-up for more. Despite the nature of AAA these days as being a “spare parts” storage team, Syracuse produced a couple of very pleasant surprises for this team. Ohlendorf went from being a throw-away MLFA signing to a productive MLB long man. Roark was one step from the dreaded “org guy/MLFA” category, and when given a chance pitched fantastically at the MLB level. Plus, the development of loogy depth in the form of Robertson and Cedeno will serve the organization well. Subscribe to comments with RSS or TrackBack to 'Syracuse/AAA Pitching Staff Year in Review; 2013'. I think that Cedeno has an opportunity to make the big club as the middle innings true LOOGY, with Blevins in the more valuable later innings LHRP who can pitch complete innings. For the crowd jockeying for the last rotation spot and last couple of bullpen spots, what they show in Viera will actually be important. Maybe we’re reading this all wrong. Maybe we’re over-rating Blevins; after all, he was NOT the marquee lefty in Oakland’s pen. Maybe the team is fed up with Detwiler’s frailty, wants him to become a power lefty in the pen and someone else is winning that 5th starter role. Either way, Cedeno seems to me like he’s going to be AAA spare part. Clay: i think he made a very good choice going to SF. He’ll be in their AAA rotation and they h ave serious question marks at the back of their rotation. If Clay re-signed here, he’s already behind a number of starters already on the 40-man. Maybe the same with Broadway; if all the money is the same, any MLFA’s goal in life is to make a 40-man roster.